Post a reply to the thread: What are the features of the app Viggle for my android smart phone? Re: What are the features of the app Viggle for my android smart phone? 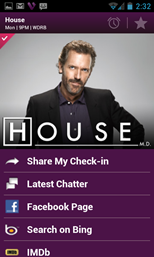 - Viggle is a new TV app available for the android phones. - The app would provide reward points for every show that the user watches. - You get viggle points for the shows you watch and buy rewards or convert into charitable donations. I know two of its features they are: TV Application, Watch your favorite show and win rewards points, etc...........................!!!!!!!!!!!! ----You can get extra point by watching "hot show"
It supports android 2.2 and above. Just login and watch your favorite shows and get reward points. Great way to have some reward points. Yeah Viggle Tv apps gives you Reward points as you watch Tv shows with it. It also gives you the detailed list from with Programme you can get max points. You must have Good Internet connectivity.It also take care about Users Choice. You can use this reward points in Old navy,Burger kind & Best buy. Viggle identifies what you’re watching and gives real rewards from brands like Best Buy, Burger King, Fandango, Old Navy and more. You get viggle points for the shows you watch and buy rewards or convert into charitable donations. The app requires android 2.2 and up. Will I be getting reward points for watching TV shows on Viggle on my android smart phone? What are the other features of the app on the android phone? Loyalty program, and reward mechanism. Check-in functionality to earn points and rewards. Watch the favorite shows and get rewards for the same. You can also play the games which also helps in getting some reward points. 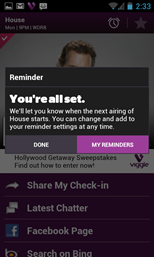 Viggle application is a TV show application where you can add in the favorite shows and get rewards. Also you can watch the TV shows and to see what is hot TV show at the moment and you can play games,quizzes and add get Viggle points. Viggle is a new TV app available for the android phones. The app helps the user to watch the favorite shows and get rewards for the same. The app can automatically know the show that is being watched by the user. The app would provide reward points for every show that the user watches. The rewards points can be redeemed through best buy, Burger king and Old Navy. The app provides the user with information on which shows to get extra reward points. The app also provides the user with games which also helps the user in getting some reward points.